"Uterine fibroids, ovarian cysts, uterine polyps, and endometriosis," from Rosita Arvigo's Ethnobotany of Belize. This special formula is only used after the Female Tonic. It is for women dealing with more serious conditions. It works on breaking down uterine and ovarian fibroids, uterine polyps, and shifting the condition of endometriosis. Please contact me for specific dosage information if you are considering taking this tincture for yourself or your loved ones. I am happy to help you in a Free 15-minute Consultation. *Not to be taken during pregnancy or while nursing. Not safe if on any kind of hormonal replacement methods. Hibiscus Flowers, Oregano, Rosemary, China Root Wild Yam, Billy Webb Bark, Cockspur Bark, and John Charles. 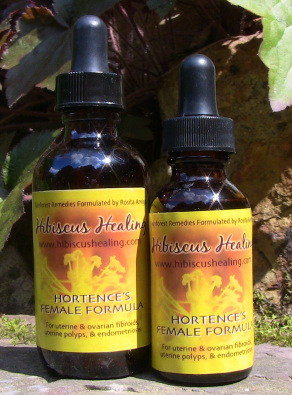 Hortence's Female Formula 1 oz.